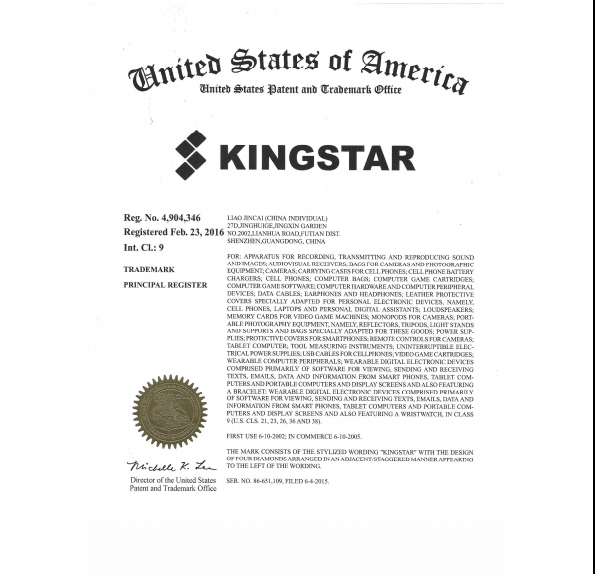 Company Overview - Shenzhen Kingstar Mould Co., Ltd.
12YRSShenzhen Kingstar Mould Co., Ltd.
Shenzhen Kingstar Co., Ltd is a professional manufacture in Electronic product,like bluetooh wireless speaker,bluetooth wireless earphone headphone headset,power bank,phone case and so on.We have advanced and professional manufacturing equipment,excellent research and development engineers,the high-quality management and an experienced manufacturing team.Our factory covers more than 1000 square meters,with about 60 employees,more than 9 years manufacturing experience.Most of our product have passed CE,Rohs,FCC,BQB certificate,Service best,is our basic principe.PEM and ODM orders are welcome.We continue our efforts in innovating without any stagnation,developing new products to meet difference needs for our customers,our aim is offer more sophisticated technology,more humane design and more considerate service to win customer's trust and approval,making contribution to the world,Welcome all of friends to visit,and establish long-terms business relationship with us for a bright future. 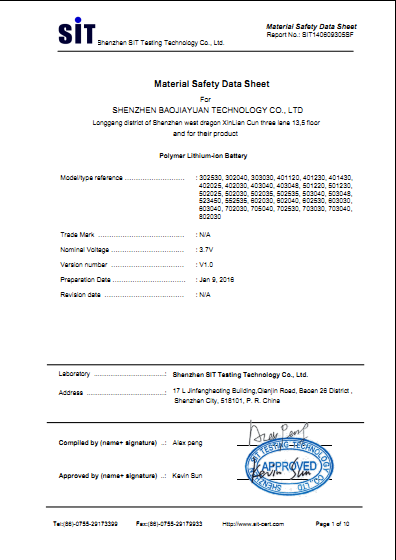 This tet report can be duplicated for the legal use with the approval of the applicant,it shall not be reproduced except in full. 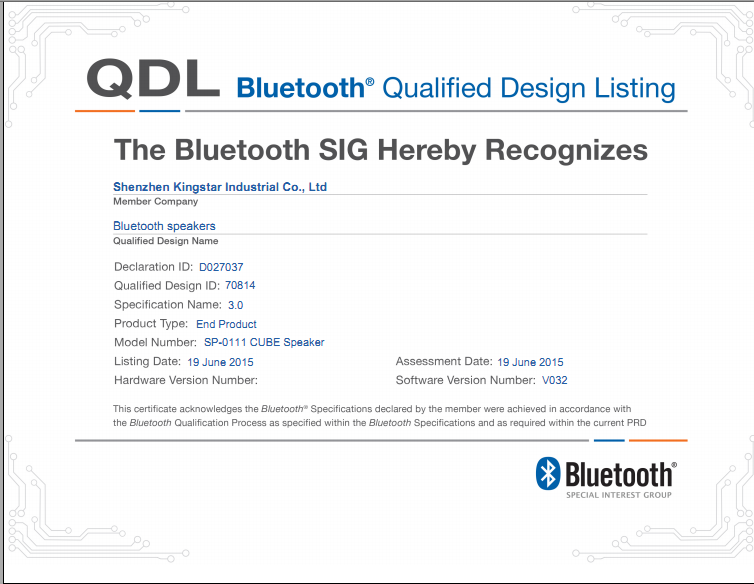 S10 Bluetooth speaker complies with the requirements of the EC rohs DIRECTIVE 2011/65/eu with amendments. 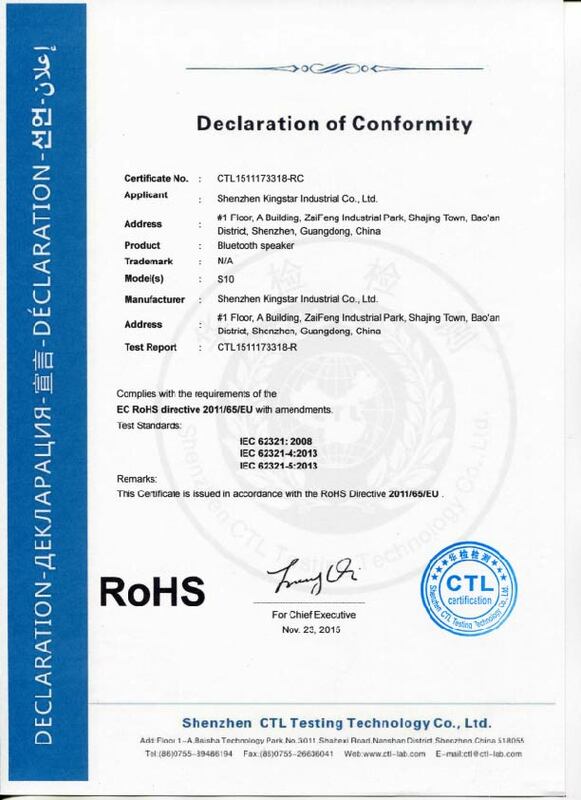 Test standaeds: IEC 62321:2008 IEC 62321-4:2013 IEC 62321-5:2013 Complies with the requirements of the EC rohs DIRECTIVE 2011/65/eu with amendments. 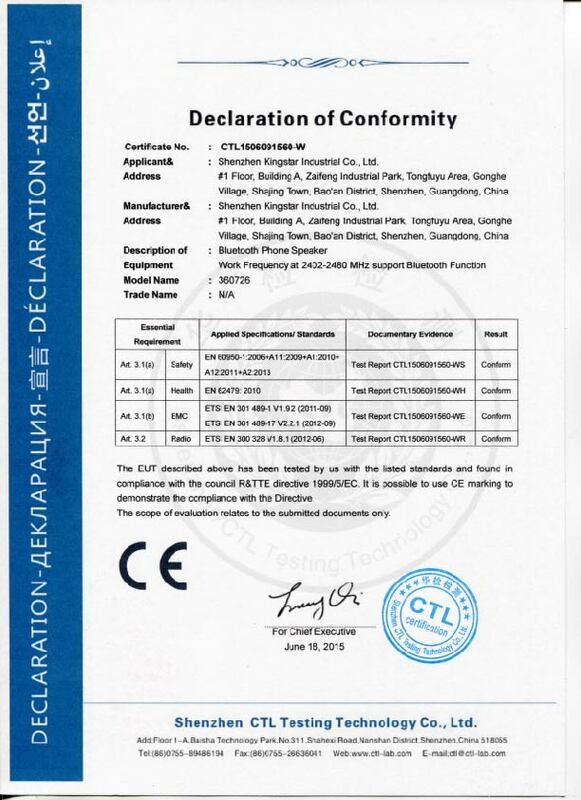 For bluetooth super bass speaker work frequency at 2402-2480 MHZ support bluetooth function,Including safety,health,EMS,radio has been test with the listed standars and found in compliance with the council R&TTE directive 1999/5/EC. 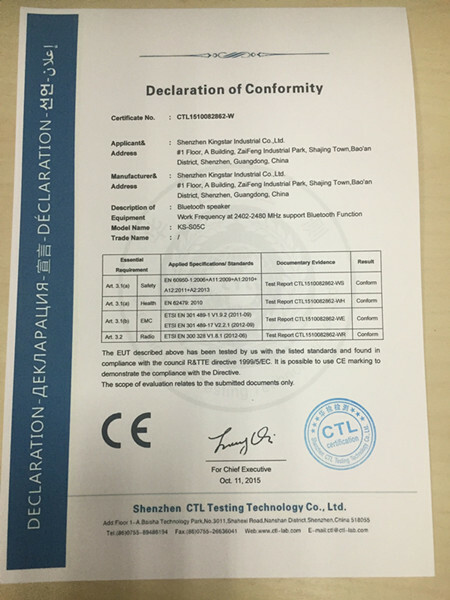 For bluetooth speaker KS-S05C work frequency at 2402-2480 MHZ support bluetooth function,Including safety,health,EMS,radio has been test with the listed standars and found in compliance with the council R&TTE directive 1999/5/EC. 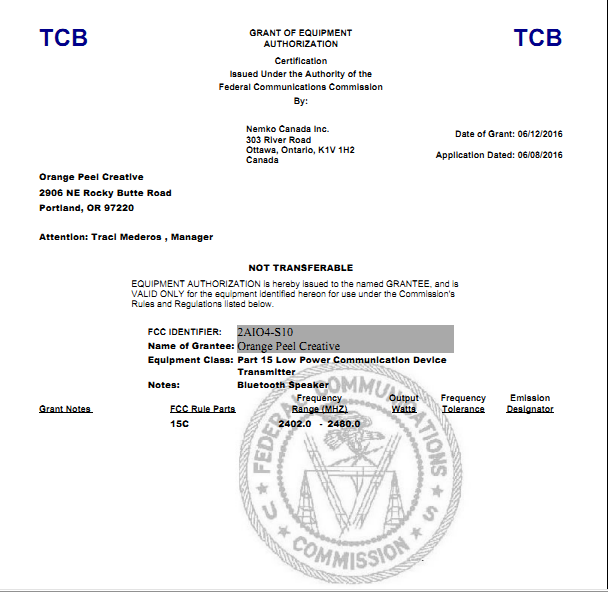 FCC part:15.249 operation wthin the bands 920-928 MHZ,2400-2483.5MHZ,5725-5850 Mhz and 24.0 -24.5 Ghz. 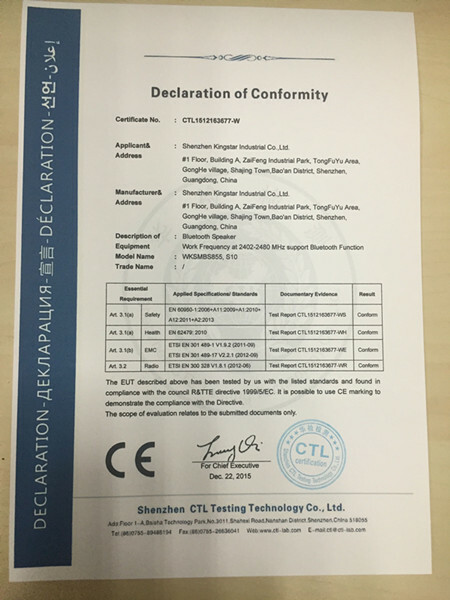 For bluetooth phone speaker model 360726 work frequency at 2402-2480 MHZ support bluetooth function,Including safety,health,EMS,radio has been test with the listed standars and found in compliance with the council R&TTE directive 1999/5/EC. 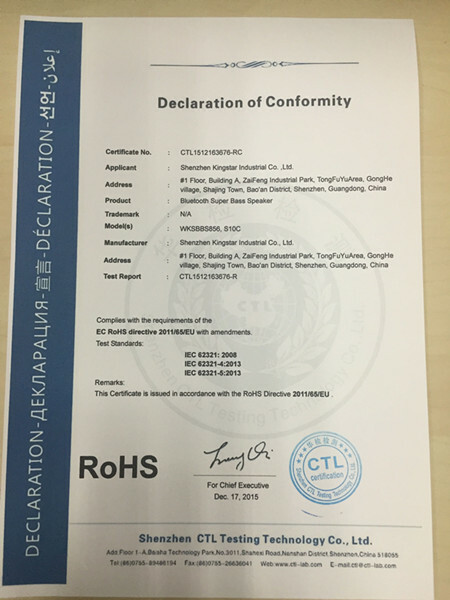 For mobile phone selfie stick monopod is in conformity with all provisions of annex 1 of council directive 2004/108/EC. 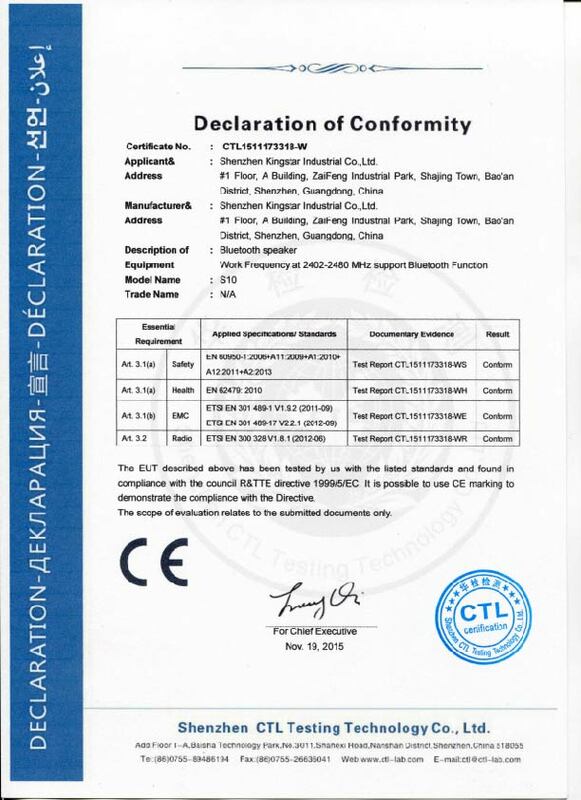 For bluetooth speaker work frequency at 2402-2480 MHZ support bluetooth function,Including safety,health,EMS,radio has been test with the listed standars and found in compliance with the council R&TTE directive 1999/5/EC. 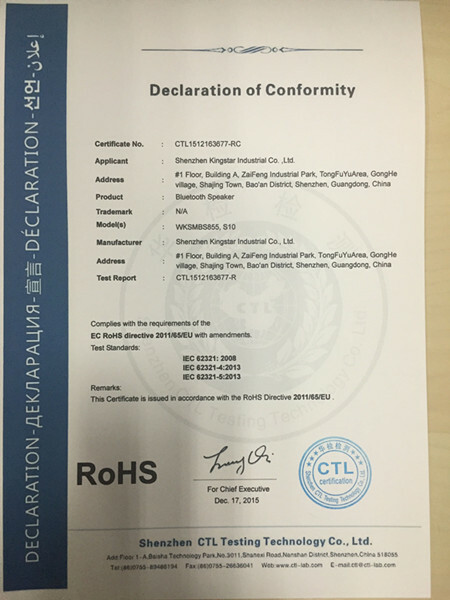 Test Standards: IEC 62321:2008 IEC 62321-4::2013 IEC 62321-5:2013 For bluetooth speaker is issued in accordance with the rohs diective 2011/65/EU. 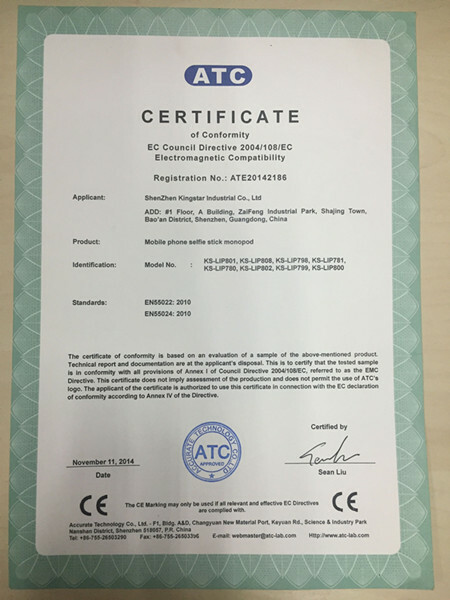 Test Standards: IEC 62321:2008 IEC 62321-4:2013 IEC 62321-5:2013 The bluetooth super bass speaker is issued in accordance with the rohs directive 2011/65/EU. 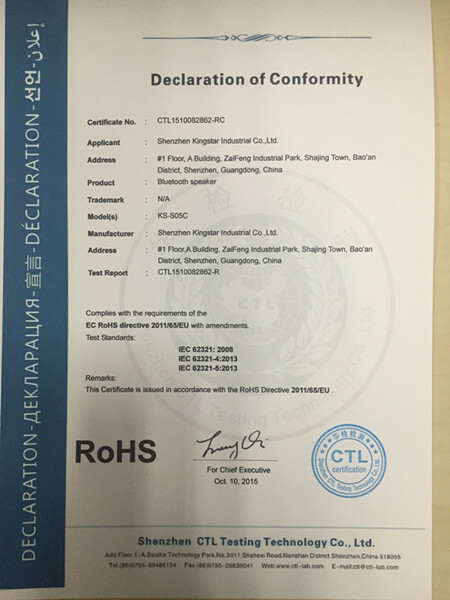 Test standards: IEC 62321:2008 IEC 62321-4:2013 IEC 62321-5:2013 For bluetooth speaker S10 is issued in accordance with the rohs directive 2011/65/EU. 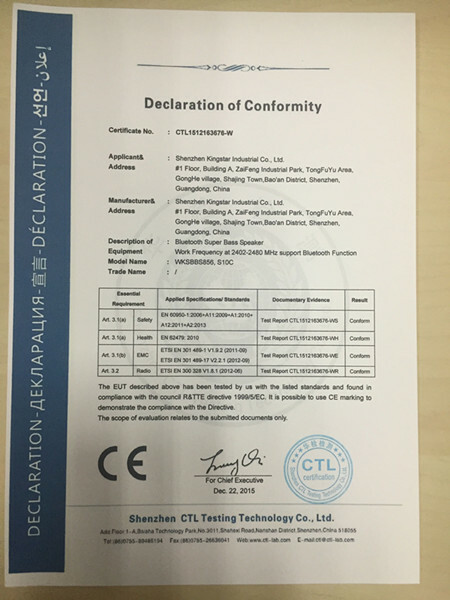 For S10 bluetooth speaker work frequency at 2402-2480 MHZ support bluetooth function,Including safety,health,EMS,radio has been test with the listed standars and found in compliance with the council R&TTE directive 1999/5/EC.